Singling out women as a troubled spot on the road to bicycle freedom is a backwards and sexist way of getting people on bikes. Saying “women don’t bike” only reinforces the idea that women shouldn’t bike. An idea that is obviously false. It’s true, there is a discrepancy between the number of women who bike for transportation and the number of men. In San Francisco, for example, about 72% of cyclists are men. This trend is common in other car oriented communities. Chicago and New York City both fall in the 25-30% range. Melbourne is only 25% lady bikers and Sydney is less than 20%! It starts to look like women really don’t bike when you are inundated with these statistics. 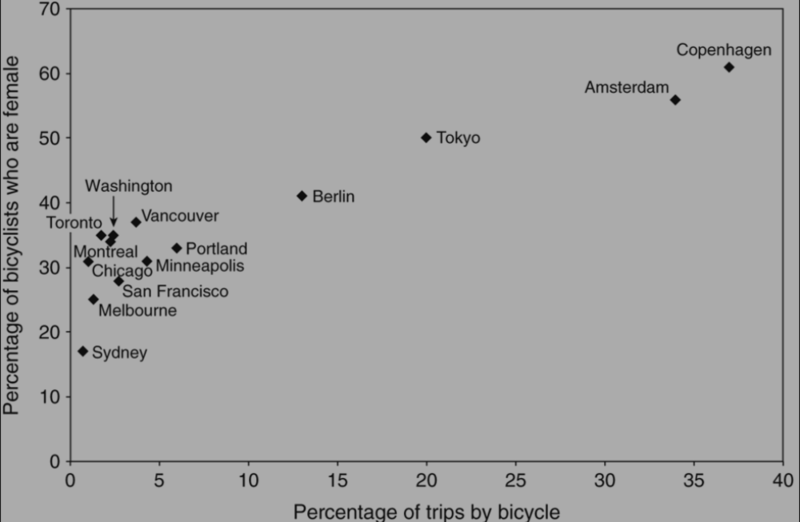 But, it turns out, there are plenty of places with a nearly 50/50 split between men and women traveling by bike. Tokyo, Amsterdam, and Copenhagen all have 50% female ridership or more! So I guess women do bike as much or more than men, it just depends on where you are. In San Francisco we have about a 3.3% commuter bike mode share. That means that 3.3% of people commuting choose to do so by bike. That also means that 96.7% of people are not commuting by bike in San Francisco! Clearly we have a problem getting all types of people to feel comfortable traveling by bike. So why is there so much media focused on singling out women who don’t bike and ignoring the bigger picture?